Performance will improve as arousal level increases to a point where optimum performance is achieved. If arousal levels continue to rise beyond this point, performance will begin to decline and explained by the Inverted-U Hypothesis. It’s critical to understand the “why” from Part 1, “The Relationship between Arousal & Performance Part 1” before moving on to this article. In this article you will find techniques to help increase or decrease your arousal level to find your optimal level for performance. Athletes can retain limitless amount of visual cues for generating imagery: animal images, machine images, forces of nature, etc. For example, have an athlete imagine they are a lion in a hunt. Imagine yourself as the lion beginning to move, building up speed, momentum, and power with each deep breath, leaping into the air and devouring the prey. Close your eyes and give it a try. With a creative mind, energy can be created to increase arousal level through imagery. At the 2015 NAS National Championships, the last event was a sandbag loading race. 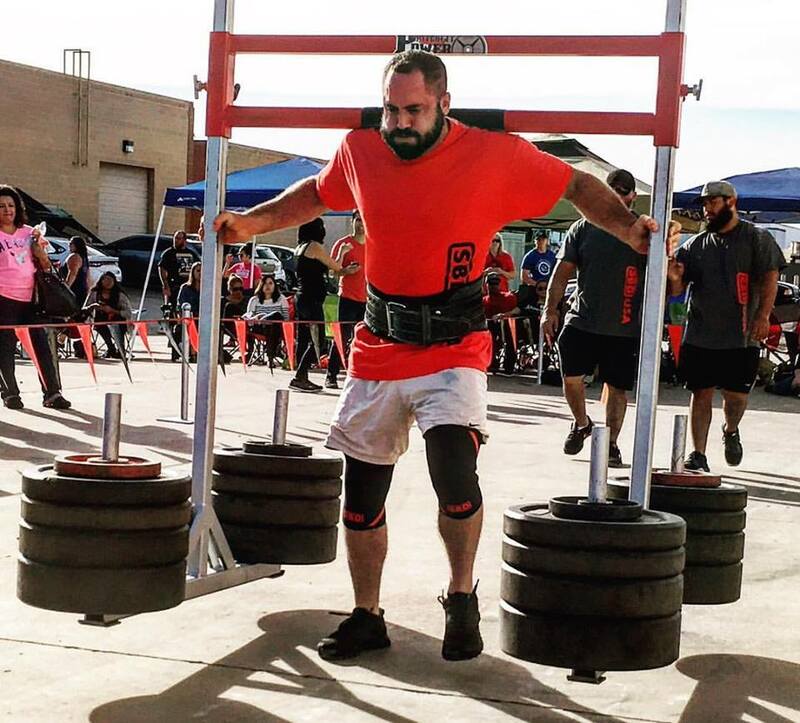 I was sitting in first place by 10 points but an event win would leave no doubt that I would win the championship and earn my professional strongman status. As I awaited my turn and the field was being reset, I imagined myself as a steam locomotive barreling down the track, clouds of black smoke and destroying anything that laid in my tracks. Entering this positive mental mindstate, I won the event and left no doubt I had won the Pro Card. Energizing verbal cues can be used at any point in competition and are effective ways to increase arousal. The athlete selects word cues that are appropriate for the competition or event that can quickly associate with building energy and focus to decrease nervous energy and distractions. Words such as explode, charge, psych up, and go are often effective. An athlete getting ready to execute a max log press must be explosive in the hips and shoulders, so repeating the word “explode” can channel focus and energy to increase arousal level. Verbal cues are also highly effective at decreasing distraction. Focus on the single word and eliminate all other stimuli around you to drown out the many distractions at a big event like Nationals. Music can be effective in increasing or decreasing arousal levels. Most everyone at a contest will have music at their fingertips on their iPods or Mp3 players. Arousal is influenced by overall loudness, tempo, and other musical characteristics like beat frequency and rate of build-up. Arousal is also influenced by the presence of emotion-laden lyrics and by tone-colors suggestive of high emotionality (e.g. anger) (Huron 2002). A classic Strongman example is Eminem’s “Till I Collapse,” with lyrics that are emotional and relative to sport along with a loud, fast tempo. We have been breathing since birth, but are you really good at it? Breathing properly is relaxing and it facilitates performance by increasing the amount of oxygen in the blood, carrying more energy to the muscles and facilitating removal of waste products (Williams 2002). In an over-aroused state, breaths are usually short and from the upper chest creating more tension and impairment of performance. Learning to take a deep, slow, complete breath from the belly will trigger a relaxation response (Williams 2002). In short, a proper breath comes from the diaphragm with inhalation coming through the nose and exhalation out the mouth. Rhythmic Breathing 4:8 tempo: Athletes inhale to a mental 4 count and exhale to an 8 count. If you run out of breath before reaching 8, take a deeper breath and exhale slower the next time. This can be a very powerful relaxation tool if done correctly and can also be used in any setting. If you have distracting thoughts or anxious feelings before an event, use this tool in combination with some of the other techniques to lower your arousal level and focus your energy on the task at hand. A mantra is a rhythmic sound of one or two syllables that a person repeats to aid in concentration. Mantras are great for combatting negative thoughts and increasing self-awareness in times of stress. Personally, as my time gets closer to competing, my mind wanders and irrational thoughts become more prevalent. “The log felt heavy during warm ups,” or, “I should have trained harder.” The negative and irrational thoughts can be a mile long. A personal mantra I use to combat these thoughts is, “I am strong, I am powerful, I am a winner.” Creating a mantra is easy. Keep it short, positive, and take ownership of it. If you’re having trouble getting started, Huffington Post’s “How to Create a Personal Success Mantra in 3 Simple Steps” provides some great starting tips. Just as imagery can be used to create energy, it can also be used to decrease arousal. Imagine being in a place promoting relaxation such as a quiet, sunny beach or cool mountain scene. Whatever image provides the athlete with a sense of calm and relaxation is the one he or she should use. For example, if you’re afraid of the ocean, the beach might not be the most relaxing imagery for you. At most competitions there is an hour between events and competitors can become restless and anxious. Using relaxation imagery during down time can help keep the mind focused and relaxed. Huron, David.2002. http://www.music-cog.ohio-state.edu/Music838/course.notes/ear04.html. Accessed January 15, 2016. TAGS: bryan barrett The Relationship between Arousal and Performance.